There a quite a few Magistrates who can't quite believe what happened in this case. As they're lay people they take their legal advice from the Clerks of Courts, but as almost anything is admissible as evidence under the law when it comes to a speeding offence it isn't surprising that there's so much inconsistency across the UK. As we've said there is a huge difference between police procedures and the law. If you'd like more information about Magistrates' Courts, try this site. 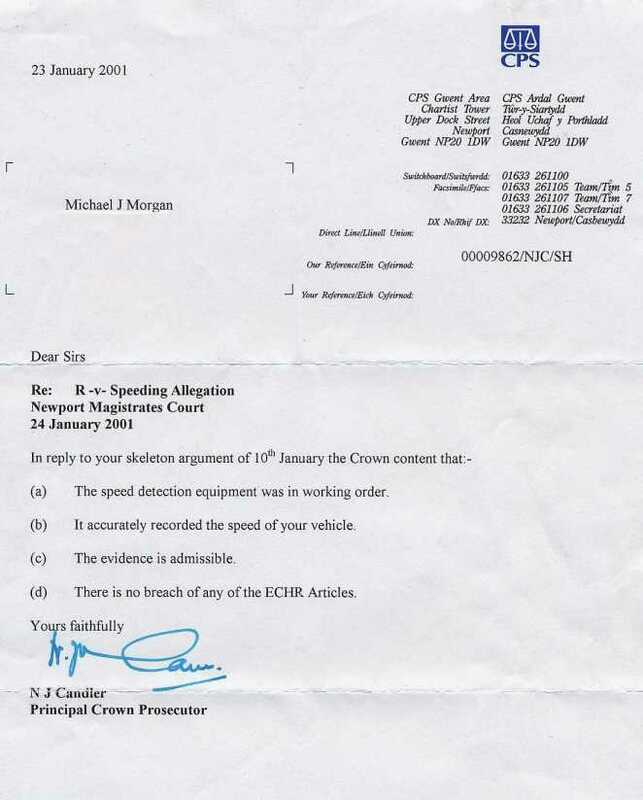 Please note that the driver of the Rover never denied driving above 70 mph, but as there was no "statement of fact" attached to the summons he never found out, and still doesn't know, what speed he was actually being prosecuted for. That would have been obvious if the speed measurement equipment was switched on! The only "statement of fact" was the police officer's sworn statement. However, by using information obtained from the traffic video we can prove unequivocally that the speed of the Rover was not as recorded in the police officer's statement. The speed of the Rover did not go from 94 down to 91 mph on the Malpas Straight, nor did its speed vary between 94 and 104 mph during the second 1 mile "follow check". We've included both our skeleton argument and the CPS's response in our correspondence file, so that you can see the basis of the case in deciding what you think a fair outcome would have been. If you work for the "independent" CPS and find the letter from them unbelievable please don't write to us write to them!